My alarm sounded at 4AM — It was another early morning. The wind was clam, and a nearly half moon illuminated my dark campsite. I put on my boots, zipped up my tent, then set out for the Patriarch Grove. Though my destination that morning was less than 20 miles away, the narrow unpaved mountain roads require just over an hour and fifteen minutes to negotiate. Many people feel a false sense of confidence on these dirt roads, and drive too fast. The washboard conditions can easily slide your vehicle several feet in either direction with little to no warning. This can be troublesome when there are sharp corners with steep drop-offs. The road was now somewhat familiar, and I kept track of several landmarks as I drove through the darkness of night. The city lights of Bishop gave a sense of context far below to my left, but the dark mass to my right was unrecognizable. I arrived at the Patriarch grove roughly an hour before sunrise, and set out to explore some of the areas I scouted the day before. It didn’t take long for the early glow of morning to make itself known on the eastern horizon. The dolomite hills were infused with a deep blue light. It was refreshing, invigorating, and mysterious. I walked beneath the skeletons of several ancient trees — their tortured limbs reaching out at me. If I was walking through any other forest at night, and stumbled upon this grove of trees, I would have felt uneasy — but there’s something about the White Mountains that puts the soul at ease. I found a comfortable place, and sat down to enjoy the sunrise. I watched as the faint blue glow gave way to a fiery band of red light, low on the horizon. This band of fire faded upward to yellow. The Earth’s shadow swept high overhead, and the sky took on the unmistakable shade of cyan that signaled sunrise was eminent. I watched the horizon for the very second the sun made it’s fiery debut. It was subtle at first, a glimmer of light not unlike the headlight of a distant car. With swift ferocity, then gleaming sparkle rose above distant mountains, setting the hillsides around me aglow in the crimson light of dawn. A subtle gust of wind swept over the mountain as the sun made it’s triumphant debut. There were a few clouds that morning, but nothing of any significance. Given the choice of shooting sunrise or sunset, I almost always prefer sunrise. The wind is calm, and the light builds — something that I appreciate given the limitation of my equipment. The conditions I experienced that morning were no different than any other location I’ve shot at sunrise. The conditions were calm, and the light was fantastic. If I choose to photograph a sunrise at this location, I will need to select a composition that doesn’t rely on the presence of clouds. I spent the rest of the morning scouting the grove for other photographic opportunities. The small amount of clouds that morning signaled a good chance of afternoon thunderstorms. My goal was to setup one of the easy shots I scouted the day before. I loaded two film holders, then spent the afternoon scouting my first shot. I knew I wouldn’t be able to get any golden late light on my subject, but I hoped the cloud formations would make up for it. I exposed 4 sheets of film that evening. The first two were in the harsh light of mid afternoon, but with the sky full of clouds. Just before sunset, I took two more exposures. By then, the clouds were minimal at best. Though I didn’t get the ideal combination of light and clouds, I was glad to get my first shot under my belt. I looked forward to trying my hand at a sunrise shot in the days to come. This entry was posted on September 19, 2012 at 5:00 am and is filed under 8x10, Photo Trips, Photography, White Mountains Aug 2012. You can follow any responses to this entry through the RSS 2.0 feed. You can leave a response, or trackback from your own site. I love watching your videos and learning the mechanics of going on a photo shoot. And your images are truly astounding! You’re an excellent teacher also:) I find myself anxiously waiting for the next video or blog entry. I am beginning the process of shooting large format (don’t have the camera yet) as it seems to be the only real way for me to get the images I want. I tried to rationalize using medium format or dslr, but as you know the smaller formats are more limited, especially when it comes to near / far focus, not to mention the limitations of enlargements. I have wondered what camera movements you most use in your photography? Do you routinely employ most or all camera movements, or does the real world of landscape photography only require front and/or back tilt? You are truly dedicated to your art and it shows in your quality output. Thanks for the feedback Stu, and I’m glad to hear that you enjoy my blog. I’ve thoroughly enjoyed shooting LF for the past few years, but there are many situations where it simply isn’t practical. At some point, I’ll add a dSLR to my setup again for those times when LF just isn’t ideal. Lens movements are often quite simple when it comes to landscape shooting. I often use a bit of front rise or fall, and I almost always use some degree of front tilt. If I want to exaggerate the foreground of a photo, I’ll use rear movements to distort things a bit. Though the amount of control is intimidating at first, you’ll soon get a feel for it, and adjust the camera without even thinking about it. I wish you the best of luck with your journey into LF! Just curious, In the video you said you shot on colour negative film due to the high contrast but the caption of the picture says Velvia 50 which is colour slide film?? Also, you should do a video of all the non-photographic equipment you take with you on these trips. I’m planning on making a few similar trips in the coming months here in Australia and would love to know what camping/survival/food/shelter equipment you normally pack for a trip. Thanks for the comment Mark. I shot two photos while there were some clouds in the background — one on Velvia 50, and the other on Ektar 100. 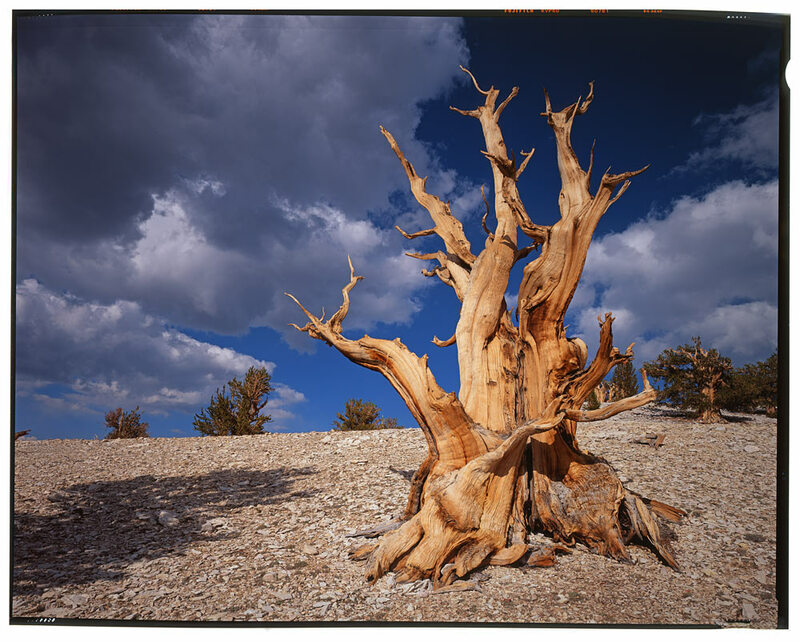 Though both are okay, I decided to post the Velvia 50 because the clouds are better aligned. Neither are amazing shots though. I wish the clouds were still around at sunset! I’ll likely make a blog post about my camping gear at some point. Essentially, I have two setups — one for when I’m close to my truck, and another that is ultra lightweight for backpacking. My next trip will involve several days of backpacking with my 8×10 gear (yup — I’m insane). That setup will likely be discussed in future video journals. Nice post Ben. I think there may be a bit of the poet in you. I like your description of the White Mountains, and agree there is a special quality there. I get a sense of permanence and timelessness when I wander there. Reading your accounts helps me to remember that landscape photography isn’t about chasing the perfect photograph, it’s about experiencing some of the most awe inspiring places on earth and witnessing the best it has to offer, and if I happen to get a good picture while I’m at it…Great! I know some people have a hard time understanding the beauty of the White Mounains, but if they witnessed a sunrise from that grove, they’d get it. It looks like that picture, while made under difficult situations, has a couple good things going for it. First, it looks technically perfect – as we’ve all come to expect. Second, it looks like it has a 3D quality to it. Do you think that’s because you chose a wide angle? I have a hard time composing outside of the range of normal-wide to normal-tele, but really enjoy well-done wide angle photos by others.